This journal is indexed by 'Scholar Article Impact Factor' on the 01 March 2016. 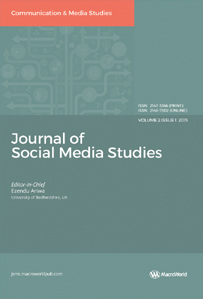 The journal seeks Manuscripts may be philosophical, theoretical, methodological, critical, applied, pedagogical, or empirical in nature, as well as empirical contributions as papers that address the theoretical and methodological debates within social media. Published articles in JSMS will be subjected to rigorous peer review comprising initial editorial screening and anonymous refereeing by at least two referees of the discipline.